Screen Capture of Donad Trump's Twitter account on November 7, 2018. The balance of powers that defines liberal democracy is most apparent in the US, and could produce three possible scenarios. The first is that the same political party dominates the Executive and the Legislature, which was the case before the mid-terms. The second is that parties are split, and one controls the Senate whilst the other controls the House of Representatives which is what has just occurred. And finally, the last scenario is that in which the opposing party gains control over the entire Legislature whilst the executive remains in other hands, the most desirable for the Democrats, which they failed to achieve. This complex system was designed so that its inefficiency stopped the imposition of one body upon another, allowing for controls of the executive to be put in place. Protecting minorities from majorities was also one of the obsessions of the Founding Fathers. Facilitating partisan equlibriums between these two powers creates a dynamic of bi-partisan negotiation and reinforces democratic consensus, whilst limiting presidential power. This is of great importance, particularly when the White House is occupied by a figure with authoritarian tendencies. In what has been one of the most tense campaigns in electoral history, many issues affecting Latin America have also taken centre stage. That is why we present some of the key factors that influence the election results. Throughout the Republican electoral campaign, Trump’s lies only heightened, and became a strategy used without scruples. His systematic slandering of the press has devastating effects however. One of the most important roles of the free press in a liberal democracy is to inform citizens so that they are aware of what is happening around them and can form an opinion accordingly, thus discrediting the press as all lies and Fake News is a terrible betrayal of democratic principles. As a strategy to defend himself from serious criticisms regarding his abuse of power, lying has proven effective, but it has proven toxic for the set of controls upon which the democratic system is based. As a strategy to defend himself from serious criticisms regarding his abuse of power, lying has proven effective, but it has proven toxic for the system of controls upon which the democratic system is based. Trump has even suggested that there were camouflaged Islamic extremists among the caravan of migrants that left San Pedro Sula in Honduras, a lie of the most insulting nature. He also declared that the “accuser” who claimed Kavanaugh was guilty of sexual assault was lying. Everyone identifies this “accuser” that Mr. Trump was refering to with Cirstine Blasey Ford, the brave woman who testified before the Senate committee. However, the "accuser" that confessed she lied was in fact one of several women that accused Kavanaugh of abuse. Her case did not travel far. The war of misinformation and discrediting the press undermines reality and one of the pillars of democracy. When we see Trump constantly lying, it sends a message that this is permissible and that this type of behaviour can be reproduced in Latin America in the form of fake news. Trump's strategy imitators proliferate. This has been the case with Bolsonaro in Brazil. A formula of success, that unfortunately plunges us into an Orwellian world of doublespeak and post-truth. During this campaign, the Democrats have outdone themselves and have put forward a record number of female candidates. In the first elections after the #MeToo movement made headlines, the success of female candidates has been significant. There have also been failures, however honesty, diversity and renewal have been important themes in these elections. 98 women will occupy the House of Representative, a huge increase from the previous record of 85. 98 women will occupy the House of Representative, a huge increase from the previous record of 85. For the first time there are also two female native American representatives, a Muslim woman original from Somalia, and one of Korean origin. The wave of women that have committed to this political campaign obligated the Republicans to get involved, filling gatherings with lilac signs with the slogan “Women with Trump”. What is undeniable however is that this time round there were more women voting for Democrats (about 60% of total women voting, according to polls) and that a caravan of female representatives are now on their way to Washington. The political commitment of women is also increasingly powerful in Latin America where we’ve seen campaigns such as #AbortoLegalYa provoke a huge green tide throughout the region, or #EleNão which has mobilized a huge female resistence against Bolsonaro, a fundamental aspect of the Brazilian presidential campaign. This kind of resistante will prove crucial to democracy in the dark times ahead. Many analysts agree that accusing Hispanic migrants of delinquency and reinforcing promises of building the border's "high, beautiful" wall were among the winning arguments of the Trump campaign in 2016. “Bad men” he proclaimed. Nothing has prevented him from continuously attacking immigrants since he took office, manipulating fear over an "invasion" of Latin American migrants to proclaim a national security threat. The caravan of migrants that begun in Honduras and that is currently making its way through Mexico has provided the perfect propaganda images to the Trump campaign. He even claimed that he would respond to those who attempted to enter the US by force with bullets and that this was an invasion that required 5000 troops to be sent to the border, if not many more. This is a complete overreaction that securitises an issue relating to inequality. Sadly, this is a phenomenon that has already been exported to Latin America, where no one is surprised to see a police officer carrying an automatic gun thought out for combat in the Afghanistan war. 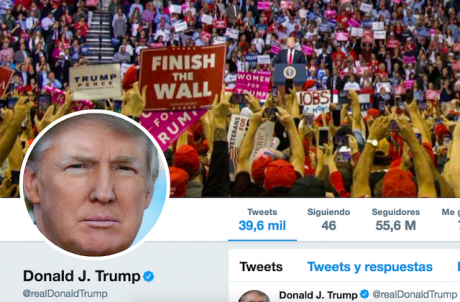 Trump graces his Twitter account with a picture from a political gathering in which a sign that says ‘Finish the Wall’ is displayed, while many others are saying 'Women for Trump'. But luckily for Latin Americans, his "tremendous success" in these elections is a total farce. From now onwards, Congress won’t approve the budget for the wall, it will become increasingly difficult to deport the 700,000 dreamers, who in their majority are Latino, and more women than ever will be on their way to Capitol Hill to put an end to the abuses of power that we have all become accustomed to.